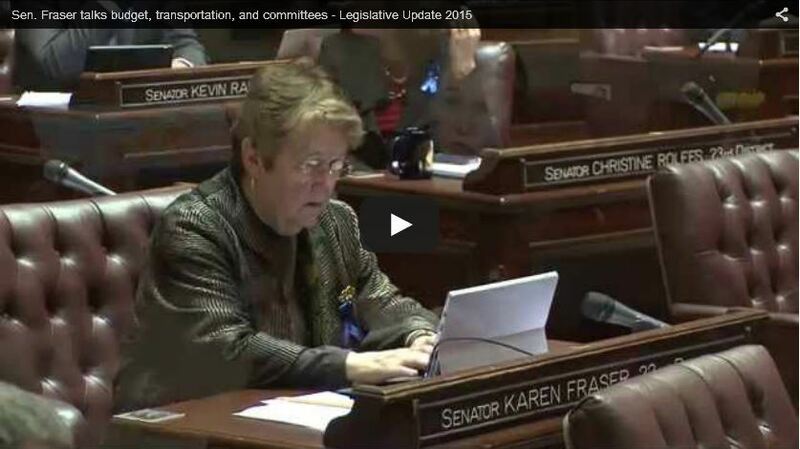 To subscribe to Sen. Fraser’s E-Newsletter, click here. We just passed the first major legislative cutoff deadline of the session, the deadline for policy bills to get out of policy committees. The next legislative deadline is the fiscal cutoff on Feb. 9, the date which all bills in fiscal committees need to advance. I want to take some time to share with you a few of the things I am working on. There is much to accomplish before we adjourn on March 10, the last scheduled day of the session. The crisis of homelessness in our state is growing and impacts every community in our state. Each year, in spite of plans, programs, and financial investments, the rate of homelessness in many of our communities is increasing. For example, preliminary results from the One Night Count taken on Jan. 28, show that homelessness in King County is up by 19 percent from last year, and in Snohomish County has increased by 54 percent. The Office of Superintendent of Public Instruction estimates there are more than 35,000 homeless kids in our schools. That number in actuality could be much higher, because many of those students could have siblings that are not yet in our K-12 school system. I participated in “I Count Thurston” on Jan. 28 when homelessness counts were going on all across our state. In Thurston County, instead of counting, homeless people were interviewed, with the goal of gaining more information about the homeless in order to improve their circumstances. I went out with Sen. Sharon Nelson, D-Maury Island, at 5 a.m. in the dark, and cold, and in pouring rain to conduct interviews with some in our community who are homeless. There were common themes of lack of income, inability to get a job, chemical dependency and substance abuse, mental illness, trauma, and other situations that can be barriers to getting into stable, permanent housing. Despite the major efforts to count the homeless in our state, I don’t believe that we will ever know the completely true number, as there are many people that will not be found and included in the counts. In Thurston County, the homelessness numbers are still being compiled and will be released soon. Last year’s report shows that more than 475 people were homeless. 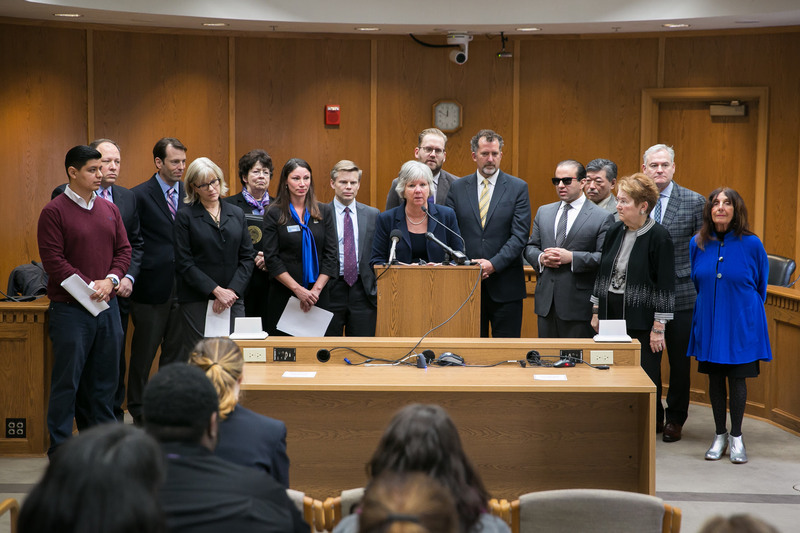 I was proud to stand with Senate Democratic Leader Sharon Nelson of Maury Island and my Democratic colleagues when the “Bring Washington Home Act” (SB 6647) was introduced to the public last week. During the press conference, we heard from Olympia’s Mayor Cheryl Selby, Vancouver City Council member Alishia Topper, and Julio Cortes from Cocoon House, a non-profit in Everett that is providing long and short-term housing for homeless youth. This bill proposes to use funds from the state’s Rainy Day Fund to create public/private partnerships that will invest in rapid rehousing, shelters, and chemical dependency, behavioral, and mental health treatments, to name a few. 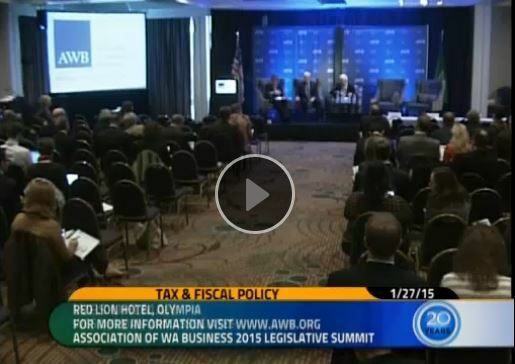 Click here to watch the press conference on TVW. One of the committees I serve on is the Senate Accountability & Reform Committee. I am the lead Democrat on the committee. I was recently interviewed together with the Chair of the Committee, by TVW’s Anita Kissee about the work of the committee. Here’s the link if you would like to watch it. Recently, the committee heard a report on homelessness. I was pleased that SideWalk Homeless Services, based here in Thurston County, was able to lend their voice to the discussion. SideWalk has a reputation for excellence. SB 6622 – Pension Protection – A bill that would protect state pension recipients from predatory financial practices. There are businesses that ask pension recipients to, in effect, sign over to them all or a large portion of their hard-earned pension benefits in exchange for an unregulated lump sum loan. SB 6621 – Lethal Force Policy Task Force – This bill would create a task force to make recommendations to the 2017 Legislative Session on what state law should be regarding law enforcement use of lethal force. This is in response to high profile incidents in the State of Washington and across the country where a number of unarmed people were fatally wounded by police. I’m working on this bill in cooperation with the Black Alliance of Thurston County. A full legislative response to fully funding our K-12 basic education system continues to a difficult challenge, in spite of major work during the interim. I join with my Senate Democratic colleagues in calling for complying with the State Supreme Court directive to develop a plan for fully funding public schools. In 2011, the legislature temporarily increased the amount of money schools could raise through property tax levies, so that school districts could get through the recession. This temporary increase is set to expire at the end of August 2017. This poses a major problem for school districts that rely on local levies to pay for teachers and extracurricular activities and programs. Think of all the programs, activities, and teachers that could be in jeopardy without these funds. One of my colleagues, Sen. Rosemary McAuliffe, D- Bothell, sponsored Senate Bill 6183, which would maintain local levy funding at current rates until 2020. Beginning in 2021, the levy lid would be slowly lowered to pre-recession rates. My most important job is to represent YOU. Your input on these issues is important and valuable to me. Please continue to contact my office if you have any questions or concerns about state government. We also had the pleasure of swearing in two new Senators: Reuven Carlyle of Seattle and Dean Takko of Longview. I am excited to welcome these two former House members and their valuable experience to the Senate Democratic Caucus. Throughout this short 60-day session, I will be working to address Washington’s top priorities, which include constitutional funding standards for K-12 basic education, improving our state’s mental health system, and supporting services for people in need. 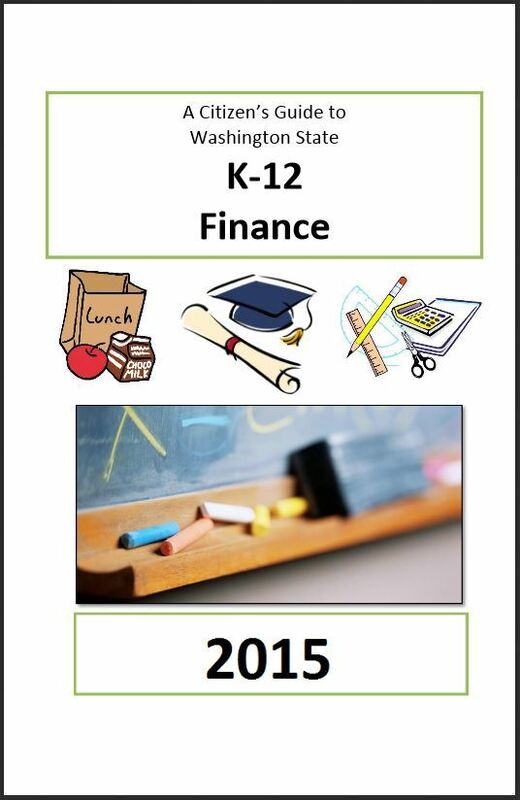 Funding K-12 Education: This session we are working towards developing a K-12 financing plan. We must come together to pass legislation that will set the framework for future investments in K-12 education. The McCleary decision mandates that we fully fund basic education in the 2017 legislative session, and it is vital that we move forward in the next 60 days. Pay Increase for Teachers: Citing the serious need for more teachers in our schools, the Governor outlined a plan to increase beginning teachers’ salaries from $36,000 to $40,000 per year that would reach nearly 8,800 beginning teachers next year. The plan also includes a minimum 1 percent raise to all other teachers and funding for teacher mentoring programs that give new teachers the support they need to succeed. These increases are funded, in part, by the governor’s proposal to close four tax loopholes. Mental Health: Too many people suffering from mental illness are unable to get the support they need due to a lack of funding. Many are homeless, in our jails, and are struggling in a wide variety of ways. The Governor has proposed to support both short and long-term needs by increasing mental health funding by $96 million. This will allow funding for four new 16-bed crisis facilities and three new mobile crisis teams across the state. Wildfire Response and Recovery: More than 300 homes were destroyed in wildfires that consumed more than one million acres of our state. The Governor proposed covering the $180 million in firefighting costs through the Budget Stabilization Account, and pulling $29 million from the Disaster Response account for all the communities that were devastated by wildfires. We need to offer support to these healing communities and our brave, selfless firefighters. As a member of the Capitol Campus Design Advisory Committee, I am happy to report that there will be some exciting projects happening around campus in the upcoming biennium. Our Capitol strives to be a leader in environment sustainability practices, and towards that end, we are welcoming a new eco-turf trial to selected parts of the campus. These slow growing grasses are designed to be low maintenance and reduce the use of water, fertilizer and pesticides, which will help prevent contaminants from flowing into storm water runoff. Two sections of eco-turf on campus will be allowed to grow to full height, while other sections will be seeded with a wildflower/turf mix. The Department of Enterprise Services, which manages the Capitol Campus, will be soliciting public feedback on this project. Check their website for opportunities to lend your voice. A meeting with local and tribal governments will be held to discuss a long-term management plan for the Capitol Lake, Deschutes Estuary, Lower Bud Inlet, and the Deschutes River watershed. The meeting is open to the public and will be held from 9:30-11:00 a.m. on Friday, Jan. 29 in the Presentation Room at the 1500 Street Jefferson Building. A number of major actions will be taken to increase availability and convenience of parking spaces on campus. Reserved parking spaces will be reduced to open more visitor parking spaces. Re-striping, better lighting, and new signage in the East Plaza Garage are all part of the plan. For more information, see the latest notes on the Capitol Campus Parking Strategy Implementation Plan. An 80-100-year-old tree was regretfully removed from campus for safety reasons after it had been badly damaged several years ago. 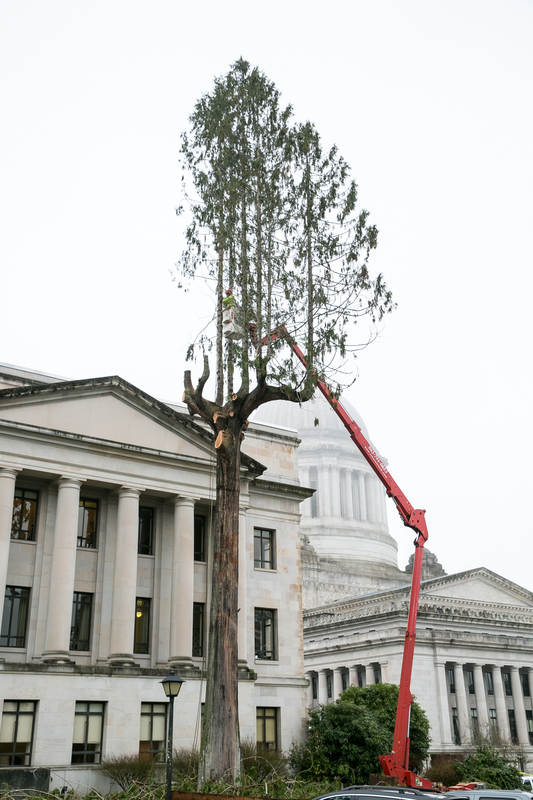 Before the tree was cut down, the local Nisqually and Squaxin tribes gathered for a ceremony. The wood from the tree will be donated to the tribes to be used for artistic creations. A feasibility study to explore the potential of restoring the skylights in the Legislative Building was funded in the 2015-17 Capital Budget and will take place in the near future. In an historic move, the Regular Session of the Legislature adjourned two days early. This is because work on bills (other than those related to the budget) is mostly finished, and the remaining work on the budget will need to take place during a Special Session. Oil train safety. Improves procedures and liability for responding to oil train accidents on land. This responds to substantial public and first responder concerns about safety issues related to the significantly increased amount of oil traveling through the state by train. Marijuana. Improves regulation of this new market. (I voted “no” because, although it contains many improvements, I feel it is not sufficiently sensitive to the needs of medical marijuana patients.) Authorizes compacts between Indian tribes and the state regarding sale of marijuana. Sexual assault examination/evidence kits in need of processing. Requires the processing of evidence collected and preserved in sexual examination kits after an assault. Sadly, there are thousands of kits NOT being tested. This is outrageous. As a result, many perpetrators are not identified and prosecuted! The most significant bills of the session are the three budget bills, and the bills necessary to implement them. Final negotiations on these will occur during the Special Session that began, Wednesday, April 29. There are three budgets that keep our state running smoothly. When you hear people talk about “the budget,” the reference is most likely referring to the two-year, biennial Operating Budget. The other two essential budgets are the Capital and Transportation budgets. 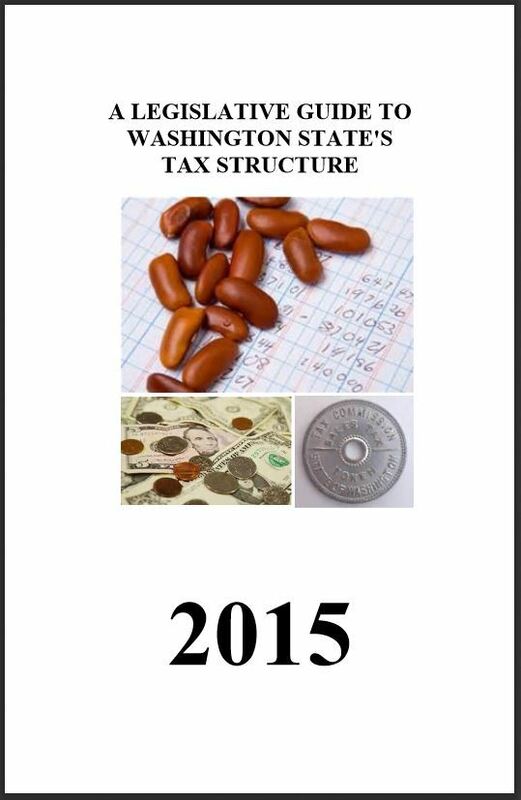 The Operating Budget is the largest and most significant budget. For the two-year period, it appropriates about $38.3 billion in state funds and approximately $40 billion in federal and other funds. Through it, funds are appropriated for: all state agencies, programs, and general government, except transportation agencies; about 70% of the needs of local school districts; higher education institutions, pass-through funds for local governments, and much more. Thus, it becomes THE most significant policy bill of the session. 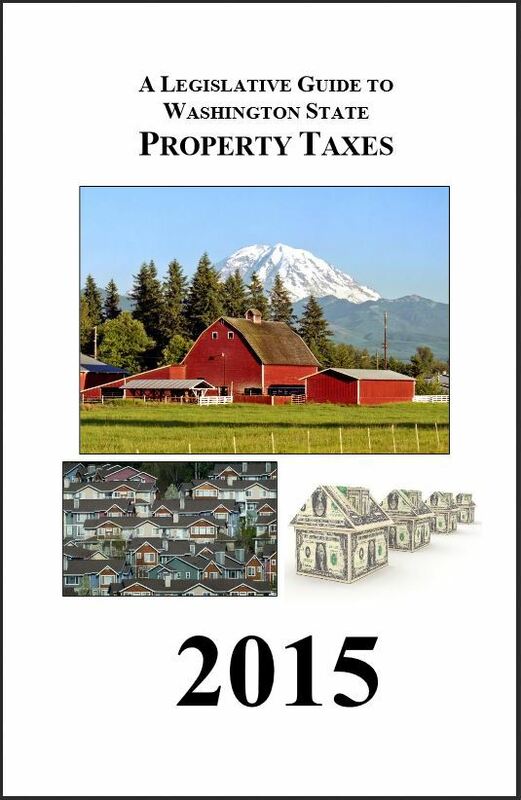 The major sources of funding for this budget are: sales tax, property tax, and the Business and Occupation Tax. 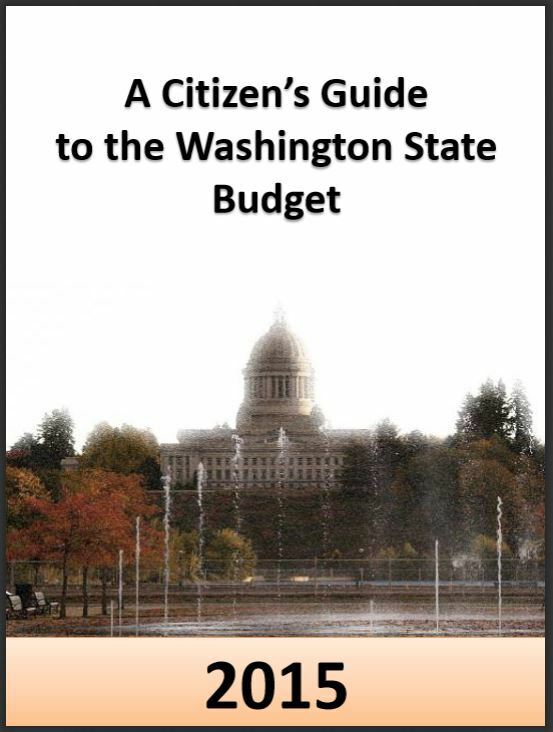 The Capital Budget mostly funds buildings and lands projects such as assistance to local school districts for school construction projects, higher education buildings, state government buildings, local government infrastructure, state and local parks. It also funds a significant range of environment and natural resources needs, such as water quality, toxic site cleanups, public lands, and much more. About half of this budget is funded with General Obligation Bonds, and the other half with revenues dedicated by statute to specific purposes. The Transportation Budget includes funding for maintenance on our roads, bridges, highways, and ferries, mostly at the state level, and includes some funding for local governments. The Transportation Budget also provides significant funds to assist with various forms of mass transportation. All three budgets will be finalized during the Special Session. The Senate and the House of Representatives have each passed quite different versions of a proposed Operating Budget. Negotiations to compromise and finish a final budget will be difficult because there are such major differences. How to fund multi-billion dollar increases in K-12 education programs for our local school districts. This is required for two reasons: 1) to comply with a State Supreme Court order that the state must fund the educational standards for “basic education” that it has enacted, and must shift local levy funding of “basic education” to the state; and 2) to comply with the November 2014 voter mandate in Initiative 1351 that calls for thousands of additional teachers and school personnel to be hired in order to improve educational outcomes for our children and youth. Within the next 5-6 years, this will require billions of additional dollars of expenditures for K-12 education. There is no way to do this without some serious revenue increases. State revenues are only “dribbling” upward slowly and are clearly insufficient to meet such a large expenditure increase. I will be advocating for achieving greater fairness in our tax structure as we find ways to better fund education. Approve the collectively bargained contracts for pay increases for state employees, home care workers, and others. Most unfortunately, the Senate proposed Operating Budget does not include the pay increases negotiated through the statutorily mandated collective bargaining process. (The Republicans/Majority Coalition Caucus members voted for this and the Democratic members voted against this.) Failure to approve this contract violates good faith bargaining, and is exceptionally unfair to state employees who have endured many years of no pay increases, actual pay decreases, and increases in the cost of their health care benefits—all during years of rising inflation. Failure to approve these increases will reduce the ability of state employees to spend their money in local businesses. Failure to approve these increases will serve as a great disincentive for quality employees to be attracted and retained by the state. The health and social service safety net for the poor and destitute, the sick and mentally ill, the abandoned and abused, and other vulnerable people. Funding of these services is essential for moral reasons and for the safety and well-being of our communities. Tuition and student financial aid. The Evergreen State College and St. Martin’s University will be seriously affected by ultimate decisions on these policies. Continuation of planning for the future of Capitol Lake; and more. Final decisions will be part of Capital Budget negotiations. The biennial transportation budget provides only for routine maintenance. The “Transportation Package,” if final negotiations are successful, is likely to include major improvements to the I-5 JBLM Corridor, including a major upgrade to the Marvin Road Interchange on I-5 in the Lacey area. 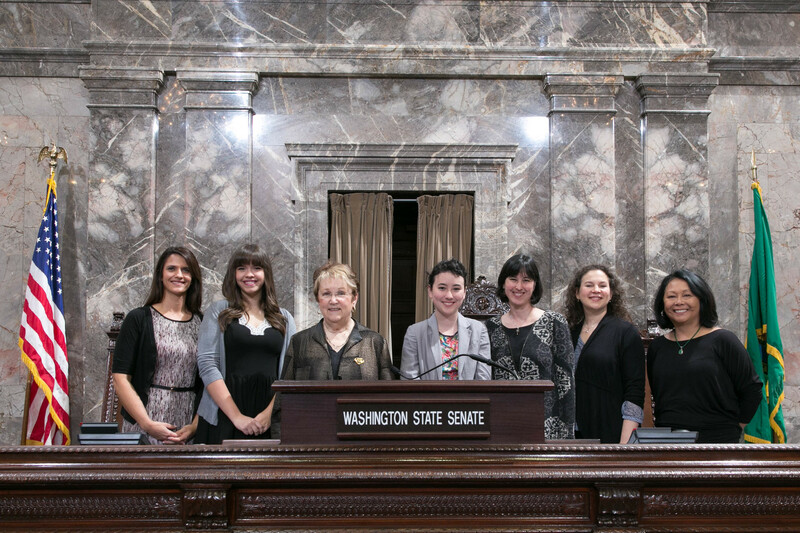 The Senate recently honored Poetry Out Loud Competition winner Alex Hanesworth of Anacortes High School (to the right of Sen. Fraser) and runner up Gabriella Sipe of Olympia High School (to the left of Sen. Fraser) for their outstanding achievement in poetry recitation. These two young ladies competed in the state’s 10th annual Poetry Out Loud Competition against more than 22,000 other Washington State students. Our state event is sponsored by ArtsWA, the state’s arts commission. The Poetry Out Loud Competition is a national recitation competition that encourages youth to learn more about poetry, learn how to analyze and understand texts, and builds confidence through public speaking. The national Poetry Out Loud contest was held in Washington D.C. earlier this week. I know our state winner Alex Hanesworth represented our state well at the national competition! G O H A W K S !!!!! We are wrapping up Week Three in the Legislature and have had a busy week of bill introduction and committee hearings. On Wednesday, 17 days into the session, we finally finished our Senate committee reorganization process by approving membership on the Senate Rules Committee, of which I am a member. This means the Senate is now in a position to move bills out of the Rules Committee to the full Senate for consideration. Next week will likely be quite busy in this regard. This week I joined legislative budget leads Sen. Andy Hill, R- Redmond; Rep. Ross Hunter, D-Medina; Rep. Bruce Chandler, R-Granger; and moderator, Former Seattle Mayor and former AWB President Wes Uhlman to talk about major budget and revenue issues facing the Legislature this year. We each had a few minutes to give opening remarks and then responded to questions from the audience. Click on the video link below to watch it. It’s about an hour. I can’t predict yet how these huge issues will be resolved. In the end, it will undoubtedly be a series of compromises that will make some people happy, some people unhappy, and others merely “relieved” that we’re done! The top priority of Senate Democrats is to promote growing economic opportunities—for jobs and businesses—that enable financially struggling families in all regions of our state to enjoy decent incomes and financial stability. We want all people to be able to have satisfying lives, be able to raise their children comfortably, to be assured that older and disabled persons are well cared for, and enjoy life in our many wonderful communities throughout the state. High quality education and training opportunities—cradle to career. Begin seriously reinvesting in infrastructure of all types—transportation, utilities, university and school buildings, environmental protection and restoration, and more. Invest in people with special needs—to end the desperation of the destitute, the homeless, the neglected, the abandoned, the people at risk of homelessness, the mentally ill, and more. Investing in assuring that the services provided by government are of high QUALITY and adequately funded. Health insurance customers who use the new Washington Health Benefit Exchange, who were unable to renew their health care coverage by the Dec. 23 deadline or were unaware of additional action needed on their account, may be eligible for a special, 60-day enrollment opportunity. These customers should fill out an online form to initiate eligibility for retroactive coverage that begins on Jan. 1. These applications will be reviewed by Healthfinder staff to ensure that eligible individuals are able to receive retroactive coverage. There is still time to enroll, but this time is running out. Customers who are unsure of their enrollment status should review their online accounts or contact the toll-free Customer Support Center at 1-855-923-4633. Local navigators and insurance brokers can be located via wahealthplanfinder.org and are available to answer questions. The Exchange will send out additional notices via email or mail to customers who had 2014 coverage with more information regarding the current status of their application. Residents interested in signing up for health coverage may visit www.wahealthplanfinder.org. Washington Healthplanfinder is a new online marketplace for individuals, families and small businesses in Washington to compare health insurance options available, to enroll in health insurance coverage, and to gain access to tax credits, reduced cost sharing and public programs such as Medicaid. The open enrollment period for Washington Healthplanfinder began on Nov. 15, 2014 and extends through Feb. 15, 2015. Washington Health Benefit Exchange is a public-private partnership established in accordance with the national Patient Protection and Affordable Care Act of 2010 which implements the new health insurance marketplace for individuals and small businesses. The Exchange is a nonprofit organization, separate from state government, and is governed by an independent, 11-member board. Travel made easier – know before you go! See real-time traffic conditions before you get in your car and make a trip? View a ferry schedule and buy a ticket? Find a car or vanpool? Learn about a highway construction project? 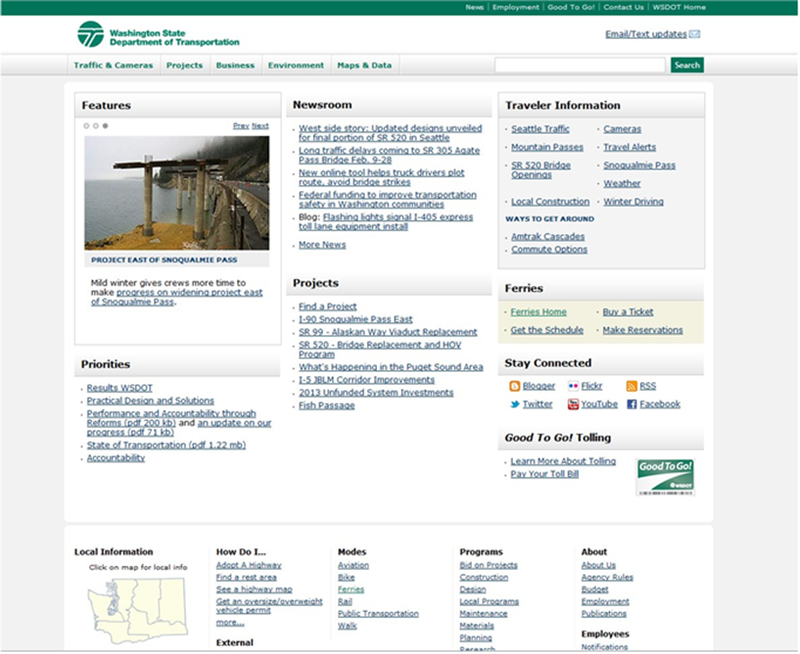 These are just a few of the many services offered on the Washington State Department of Transportation’s website. It’s viewer friendly and loaded with helpful information that’s easy to use to help improve your transportation experience—-whether driving a car, riding a bicycle, or taking public transportation. Below is a sample of what the web page looks like. We’re off and running as the 2015 legislative session begins. 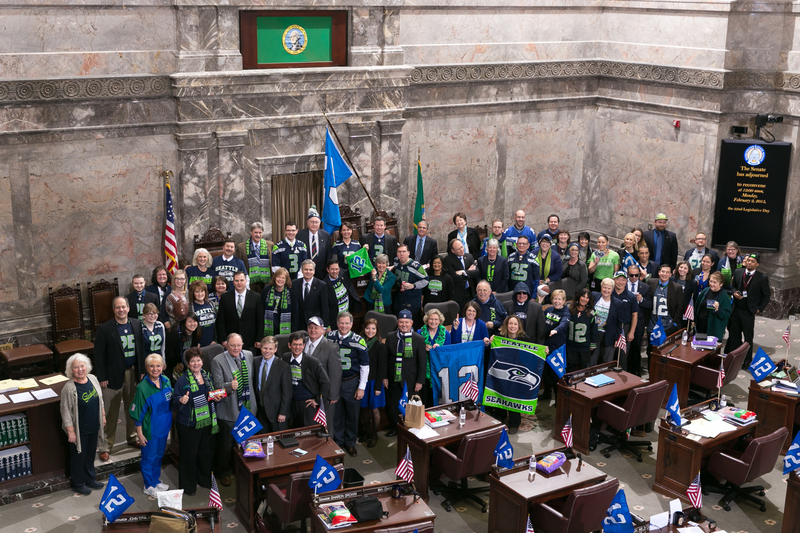 At the outset, I would like to report that on Day 3, Wednesday, January 14, the Senate honored former Washington State Governor, former President of The Evergreen State College, and former U.S. 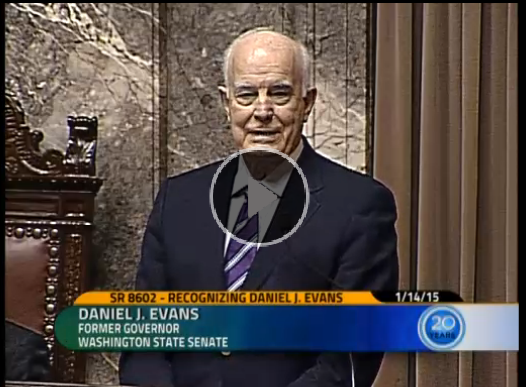 Senator Dan Evans, on the occasion of the 50th Anniversary of his inauguration as Governor. I was a key organizer of this occasion. I encourage you to read the Floor Resolution we adopted which recognizes many of his major achievements. A spontaneous standing ovation took place immediately upon the conclusion of its reading. I gave one of the two speeches in support of the resolution. I encourage you to watch the video of the occasion, which includes his fascinating account of events surrounding his swearing in as Governor, as well as some well-stated advice to the Legislature. The full video of the day’s event is about 30 minutes long. Click on the photo to play. In the afternoon, he visited The Evergreen State College, where they honored him for his strong, effective leadership there as their second President. In addition, Governor and Mrs. Inslee gave him a tour of the Governor’s Mansion, so he could see the changes that have occurred, and show it to his grandchildren. Normally, Opening Day is full of routine, as new and returning members are sworn in, officers of the Senate are elected, rules of procedure are adopted, and committee memberships are assigned. First, the election of a new President Pro Tem. The President Pro Tem serves as the Senate’s presiding officer when the President of the Senate is unavailable. On a 25-24 vote, the Senate elected Senator Pam Roach (R-Auburn) to this position. All Democrats and two Republicans voted for her. She is the most senior member of the Senate, and it is the most customary practice of the Senate to select this person for this position. The second candidate, who received the 24 votes (all Republican), was Senator Tim Sheldon, from the 35th Legislative District, who served in this position during the last two years. Second, we didn’t approve ALL Senate committee assignments. I cannot remember that this has ever happened before. Instead, we approved all committee assignments except for the Senate Rules Committee. The proposal for that Committee has to be revised to reflect the surprise election of Senator Roach to the position of President Pro Tem. Per long-standing Senate rules, the President Pro Tem serves as Vice-Chair of the Senate Rules Committee. Next week, we will probably adopt the new Rules Committee membership. It unnecessarily limits the range and creativity of policy options we can consider during this exceptionally difficult session—with its many court and citizen initiative mandates affecting us. It deters those Majority party members (mostly Republican) who might like to compromise with Minority party members (Democrats) from doing so to reach “middle ground” compromises. It has the effect of “locking in” our regressive and out-of-date revenue system, the most regressive in the nation—making it nearly impossible to find better options than merely raising sales and B&O taxes. I continue to serve as Senate Democratic Caucus Chair. Caucus Floor Leader — Senator Christine Rolfes, of Kitsap County. We just passed the halfway point of the 2014 legislative session and I want to take this chance to report on our progress in the last few weeks. With less than a month left during this short 60-day session, the days ahead will be busy. Sadly, Washington experiences its share of the horrendous crime of human trafficking. Often, the victims are people from other countries. One of the main methods of control used against these victims is coercion – forcing the person to work by threatening to take away someone’s passport and immigration documents or threatening to report the victim to immigration officials. These victims are often coerced into providing cheap labor, prostitution, or other services. Senate Bill 6339, a measure I sponsored, would make this type of coercion a felony. I hope it will serve as both a deterrent and penalty for those guilty of these life-destroying crimes. I’m pleased that it passed the Senate unanimously last week. It now moves to the state House for consideration. The bill is scheduled for a public hearing before the House Public Safety Committee on Wednesday, February 19th at 1:30pm. Last week, Governor Jay Inslee announced that he is exercising gubernatorial authority to end death row executions while in office. I am very grateful that the governor has taken this public stance. My own opinions about the death penalty have evolved over my legislative career. I believe that the Governor’s actions are justified. It is vastly more expensive to prosecute and carry out a death penalty sentence than a life-without-parole sentence. There is a huge negative emotional toll on victims’ families from multiple death-row appeals. Studies show that the threat of Capital punishment does not deter future homicides. Finally, the data is exceptionally clear that the death penalty is not implemented consistently for comparable crimes. 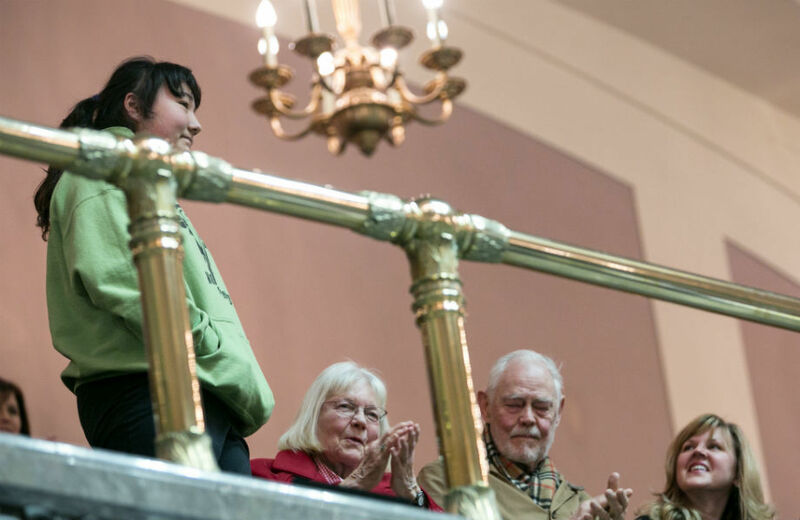 Washington is one step closer to having an “official state oyster”, thanks to the efforts of an Olympia teenager. Claire Thompson, a student at Nova Middle School, is spearheading the effort to make the Ostrea lurida the state official oyster. Ostrea lurida, sometimes called the Native or Olympia oyster, is a species native to Pacific Northwest waters and a popular component of Washington’s $270 million shellfish industry. Thompson is proposing the bill as part of a school project and to bring attention to threats facing sea life. It’s great to see our local students getting involved in the political process. 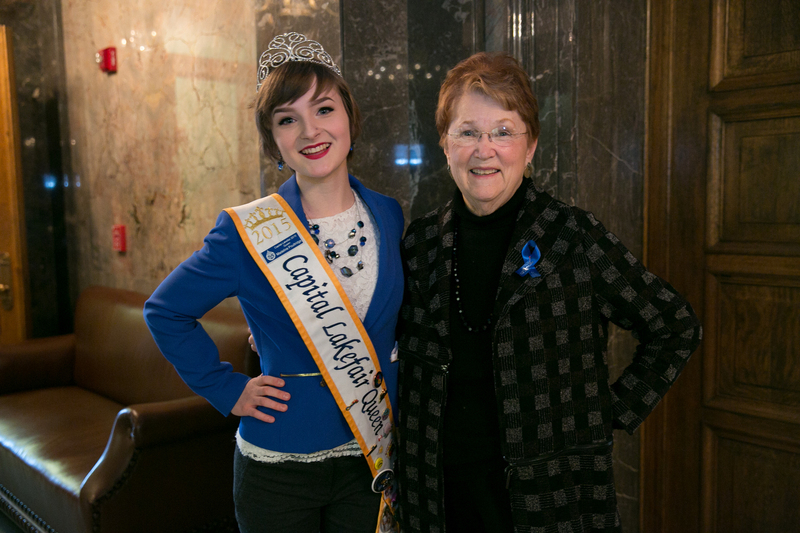 Claire was on hand last week as Senate Bill 6145 passed the Senate unanimously. We took a moment today on the Senate floor to mark an important milestone in the history of our great state. On Feb. 22, 1889, fittingly on George Washington’s Birthday, President Grover Cleveland signed legislation enabling the Washington Territory to proceed with the steps necessary to become a state. A resolution I sponsored to celebrate 125 years of statehood passed the Senate unanimously. The Washington Centennial Time Capsule was a key part of our state’s 100th anniversary celebration on November 11, 1989. 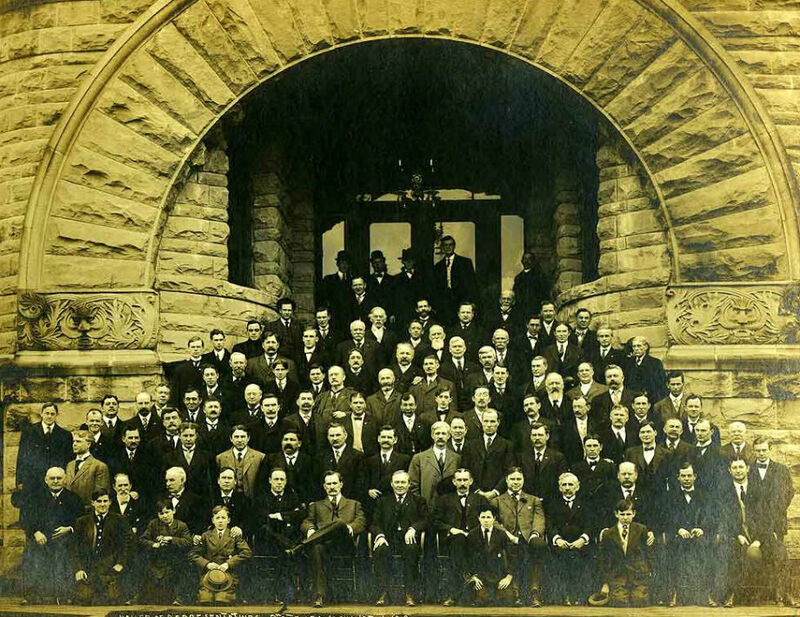 On November 11, 2014, as part of the 125th year, a new phase of the Centennial Time Capsule project will commence. A new generation of Keepers will be ushered in to preserve the Centennial capsule project for the next 25 years. To qualify as a Capsule Keeper, any child living in Washington who was born on November 4-18, 2004 is eligible to become a “Keeper”. For more information, you can go to www.capsulekeepers.org. 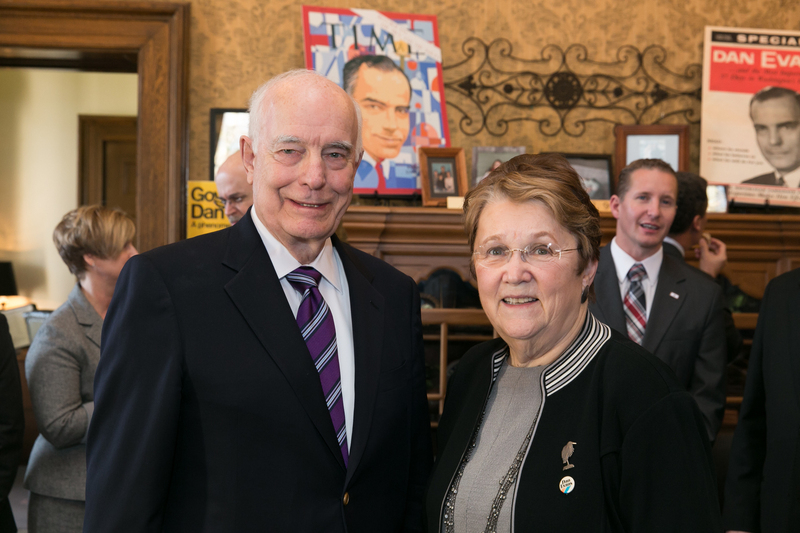 I am pleased to have the opportunity to help introduce Don Burrows, the former Washington State Revenue Director, at his book signing event on Thursday, February. 27. 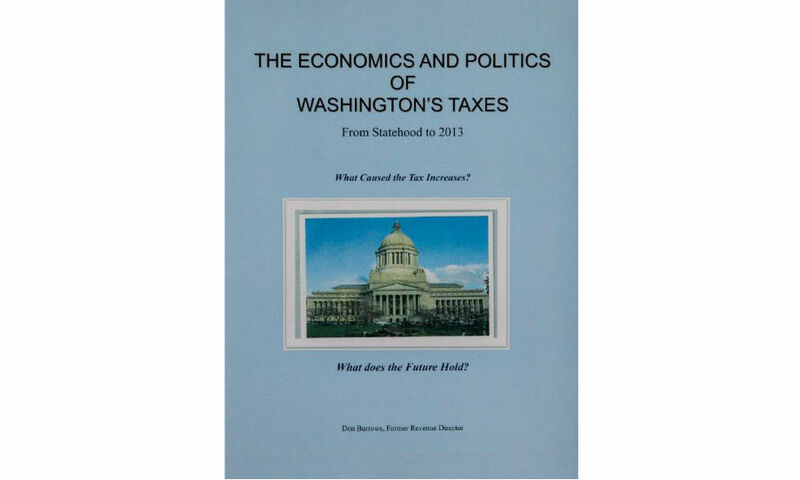 Don will be signing copies of his book “The Economics and Politics of Washington’s Taxes from 1889 to 2013” from 1 p.m. to 3 p.m. in the Legislative Building State Reception Room on the Capitol Campus in Olympia. Everyone should be interested in our state’s tax structure. I encourage all to attend! Your thoughts are always extremely helpful to me. Please feel free to contact me with your issues and concerns as the 2014 legislative session continues. Today, we begin the second week of the 2014 Legislature by taking time to remember the life and legacy of the Reverend Dr. Martin Luther King, Jr., who devoted his life to the pursuit of justice and equality for all. I will join my colleagues on the Senate floor today to acknowledge his important message. As we take time to reflect, I al so want to look back at some of the highlights of the first week of this year’s 60-day legislative session. In his first State of the State address, Governor Jay Inslee called on lawmakers to take several bold measures this year and beyond to improve education investments and finish work started last year on a transportation package. Education funding: Last week the Supreme Court took the Legislature to task for the lack of progress towards fully funding K-12 education under the Court’s McCleary decision. The Governor proposed a boost of education investments by at least $200 million this session. Transportation: The House passed a transportation investment package last year, and my Democratic colleagues and I in the Senate attempted to bring it to the Senate Floor for a vote. However, our Republicans colleagues again used their one-vote majority to block it from coming before the full Senate. Since then, negotiations over the summer were stalled when Republicans were unable to find support within their Caucus for a plan. Governor Inslee called on lawmakers to find an agreement, and I plan to work to make that a reality during the next 60 days. Minimum Wage: Governor Inslee proposed raising the state’s minimum wage to ensure all Washingtonians have an opportunity to earn a living wage. I continue to work on the state’s operating and capital budgets as a member of the Senate Ways and Means Committee. For the first time in six years, we are not talking about making cuts to vital programs people in our state rely on. However, the recovery from the Great Recession remains slow and we are seeing only modest revenue increases. McCleary Decision: The Legislature’s biggest challenge is increasing funding for basic education as ordered by the Supreme Court’s McCleary decision. The Court is now mandating we speed our progress on a plan to show how we will implement it by 2018. This is the right thing to do regardless of the Court’s mandate. We shouldn’t take the year off from making progress. Our kids are in overcrowded classrooms right now, and further delays are unacceptable.